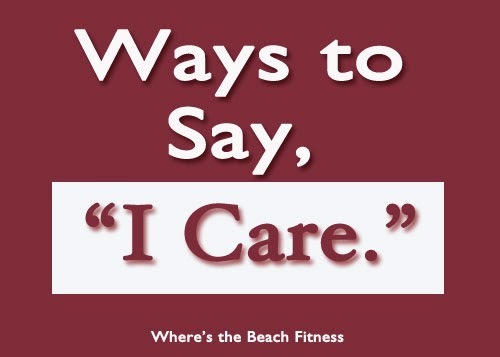 How do you tell your significant other, your family, your friends, "I care?" I'll admit, this wasn't the question or post I thought I would write. I went back and forth a million times on what I wanted to share for Fun For Friday. It's Valentine's Day too, so of course the inclination is to either go with a VDay post or go the complete opposite direction. I don't have any sappy, romantic Valentine's Day memories to share, no cutsie pictures, no couple's workout or even a recipe. After reading Heather at Better with Veggies post - 14 Ways to Say I Love You - I started thinking about ways to say I love you, or the ways in which I personally say I love you to others. This also brought me to Carla's amazing post, How Could I Love You Better. Carla's post really and truly made me start to think about how I could love Jason (and others) better. In fact, I even proposed that question to him. But, I also started to think about how I want to be loved. And how that affects the way I show my love, or assume I'm showing my love. The big ah ha moment was that just because that's the way I want to be loved, doesn't mean it's the way someone else wants to be loved or how they show their love. So when I get my feelings hurt assuming someone doesn't care because they don't call me or email me just to say hi, it doesn't really mean they don't care. And maybe calling or emailing is a bad example, but I hope you catch my drift. For me, I want people to acknowledge me, acknowledge our friendship or whatever our relationship might be. It makes my day when someone randomly sends a message just to say hi. And I love doing that for others. But sometimes it's not reciprocated so I end up letting my feelings get hurt. I say I let my feelings get hurt because it's not like someone intentionally did something directly to me. I own those feelings. I love to do things for others as well like baking, cooking, hell even fixing someone's ripped seam in a pair of pants! I tend to go out of my way, sometimes too much, to try to do things for others and then end up letting myself get upset when someone doesn't ask what they can do for me. It's like in my head if I can show that I'll climb a mountain for you, that's showing not just saying I care. But, after reading Carla's post, I realized that we are all different in how we show love and how we want to be loved. And it's important to perhaps give in a different way than you wish to receive. Turn off the tv and turn on some music. Jason and I do this quite often on the weekends. But my sister and I do the same, music can make you nostalgic, it can make you get up and dance, it can make you talk or sit and reflect. Go for a run, walk or hike together. I love the times Jason and I run together. We might go for miles without saying a word, but we're outside together, just enjoying each other's company. Again, this can be with friends, siblings and even parents. Just spending time with someone without distractions of life. Send a random email or text to just say, "Hi." Such a simple thing to do and easy way to let someone know you are thinking of them. Cook dinner and include ingredients they love. I need to remember this more often actually. Again you can do this and invite friends or family over. I guess in a way it's what we do for Thanksgiving or Christmas meals really. Give a hug. Never underestimate the power of a hug. Give your time. Sometimes all we need is just to spend some time with someone we care about. We're all busy, but time slips by so fast. We aren't guaranteed tomorrow or next weekend, stop planning and just make it happen. Ok, this was probably a heavier post than I had intended for Friday or Valentine's Day for that matter. Do you have anything to add to the list? To lighten it up, what are some of your childhood Valentine's Day memories? I remember making Valentine's boxes so classmates could share their cards or treats. Once I made a mailbox and I remember someone had put cookies in the box (unwrapped) and there were crumbs all in the box.